Stump Day is obviously Christmas; it's a winter holiday with all the decorations and carols and forced good cheer. According to the explanation from King River (Star's dad), Stump Day celebrates the founding of Mewni, when the original Mewman settlers sheltered around a stump during a blizzard, thus coming together as a people. There is a slight parallel here to the story of Hearth's Warming Eve and the founding of Equestria, but it doesn't go any further. Rather than celebrating togetherness or friendship, Stump Day is celebrated by honoring the stump that brought the settlers together, and a ceremonial stump on a pedestal is the center of the holiday display. 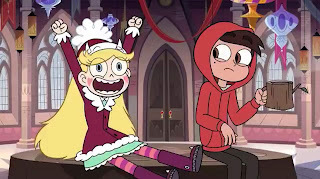 The day seems to go well, but that night Marco brings Star back to the throne room for a surprise. Stump Day is also Star's birthday, and Marco has invited some of their friends from both Earth and Mewni for a surprise party. Unfortunately, Star is furious because you are supposed to honor the stump AND ONLY THE STUMP on Stump Day. The others dismiss this as a story for kids, but then Janna casually burns the ceremonial stump. All heck breaks loose when tentacle-like roots fill the room, threatening to kill all the characters for not believing in the Stump. They survive, but only barely, and everyone learns the true meaning of Stump Day: Do not disrespect the Stump. In addition to serving as a parody of Christmas trees, the Stump joins a grand tradition of holiday characters who are both really real and really dangerous. See also Robot Santa from Futurama. This episode needs its own little premise explanation. 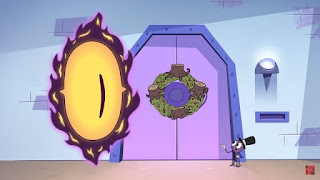 In an earlier episode, it was established that there is a place (possibly a pocket dimension?) inside Star's wand, where all the crazy things she summons live when they aren't helping her fight the forces of evil. Spider with a Top Hat was the main character in that past episode, and in this one, he's helping prepare all the wand's inhabitants for their own Stump Day party. The complication focuses on a relative newcomer to Star's arsenal: The All-Seeing Eye. The Eye is a floating eye who just watches everyone, and most of the narwhals and warnicorns and flying pigs and other spells think it's creepy. Spider encourages them to try to make friends with the Eye for Stump Day, and most agree to try. However, at the party, the Eye watches as various spells talk trash about each other secretly, and then replays those conversations publicly at the dinner table, causing everyone to flee the party in anger and embarrassment. The Eye tells Spider (through another recording) that it's doing this because "it's always best to tell the truth," and it doesn't seem to understand why people are upset. Finally, it makes amends by continuing to tell the truth, showing times when spells were kind to one another, as well as all the things that no one noticed Spider did to try and make the party great. The spells come back together to sing about respecting the stump. It's surprisingly emotionally effective considering one character is a floating eye who's always accompanied by a creepy sound effect. Overall, Star vtFoE is a show with a lot of zany humor balanced with kinetic action, surprisingly dark worldbuilding, and a good deal of heart. You might be able to appreciate this episode alone for its pure zaniness, but it's better with knowledge of the characters and the world.